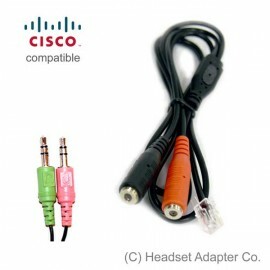 PC Headset Adapter will convert a standard computer headset with 3.5mm audio plugs into a RJ-9 direct connect headset compatible with Cisco 7941G Unified IP Phone. Computer headsets with audio plugs are available in most computer or online stores. When you buy a PC Headset Adapter, you are not limited to one specific Cisco headset. The choice is yours: existing headsets or new headsets, chat headsets or noise-cancelling gaming headsets, behind-the-neck headsets or boom-style headsets. Whichever you choose, as long as they have an individual plug for headphone and microphone, they are compatible with our adapter. Our headset adapters for Cisco Unified IP Phones allow you to use all features that Cisco 7940 Unified IP Phone provides. You can answer a call with either headset or handset, and you may switch between them during the conversation. You can use Auto-Answer with the headset or the handset. You can save volume settings separately for speakerphone, handset or headset. These adapters are compatible with hearing-aid in-line amplifiers. Connect a desktop speakers and an external microphone, and use standard Cisco 7941 phone as a conference station. Configure phone with Auto-Answer feature, you may connect a "loud speaker" for overhead announcements.